Today is Day 0 transplant Day – I’ve been reborn with own stem cells harvested almost three weeks ago and kept frozen in liquid nitrogen. This is my room, #401. The window faces south so I get the sunshine all day. 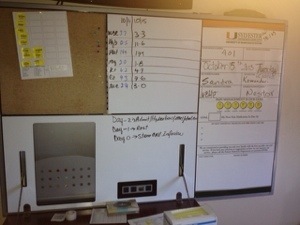 This is the whiteboard where they keep me posted on my CBC results and how I’m tracking day on day. This is what my whiteboard looked like a this morning as I was waking up. 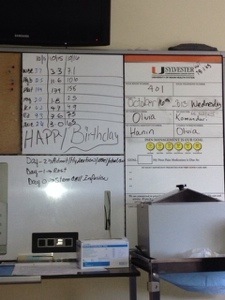 Notice the new set of numbers and the large Happy Birthday written on the board. Gloria brought up the cart on the lower right, which has a water bath that gets heated to body temperature. 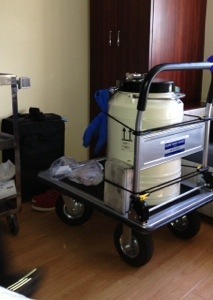 This is where my stem cells will be thawed before being infused. This is the over-sized Dewar flask filled with liquid nitrogen and 6 packets each containing 2.1 million of my blood stem cells. The technician, Alejandro, carefully removes a packet, one at a time checking the labels, with Olivia double checking, to see each time that these are my stem cells, and places it in the water bath. 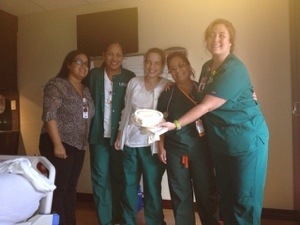 When thawed, he hands it to Olivia, my transplant nurse. Olivia let’s Alejandro know when to thaw out the next bag of 2.1 million cells. Very good teamwork! Hanging up there on the left is where Olivia hung each of the 6 bags in turn containing my stem cells, coming home to papa! As part of the process I was given diphendramine (Benedryl) which made me quite drowsy and I fell asleep after the transplant was completed. I woke up feeling pretty good. From where I sit in the catbird seat, all things are going smashingly! Praise be to God! 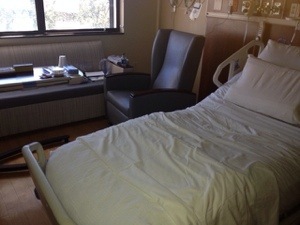 After I woke up, Olivia wanted to have my bed made over with fresh sheets, and Hanin came in and did a wonderful job. I’ve touched on this once before, but it bears repeating. There really is something very spiritual about this whole process. Here is truly a melding of science and spirit. God leads us to the place where the chance of a cure or certainly a long term remission through medical science. It was then up to me to pray over the melphalan that the chemo treatment reach every single myeloma cell as well as any progenitor cells that may be lurking around. I then prayed to God to ensure that all happened as required. 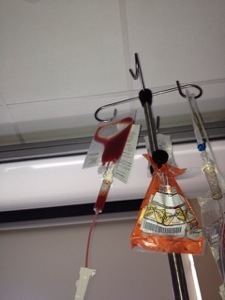 You’ve already heard the marvelous response when I had my stem cells collected. This was also God’s doing in producing a bountiful harvest. Half were given to me today, and Sylvester will keep the remaining 12.5 million cells in case I should need them again. So today I prayed over my stem cells that they quickly get to where they are going to my marrow, properly engraft themselves, and start producing, red blood cells, platelets, white blood cells and in high numbers that I will need in order to be released. More on this tomorrow. Thank you all also for all your prayers, mine alone are not enough. This is another team effort, God, medical science, your prayers and mine. 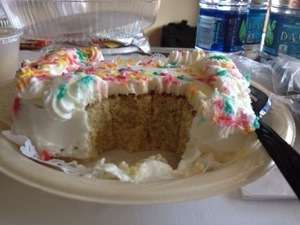 It was actually very good, and the sugar pick me up is what I needed too. Thank you, Lord Jesus for my healing, and for the healing we pray for in others, especially Leighton, Barbara, Hirma, Berris, Mike, Sylvia, Nicola, and Joe. Thank you, thank you dear Lord. We pray for you and Kathleen. Love to you both, and also to the nurses and doctors. Happy Birthday, Karl! I am absolutely thrilled and so is Mom! I was very touched by all you have written here – almost brought me to tears. God bless you! Surrounded by cool lab equipment, nurses feeding him cake, and sunny days… Yup my worry level went down a few notches… but wish I could snuggle my Daddy! I love you! Thanks for letting us know what’s going on!